Schon bald beginnt das Geschäftsjahr 2019. Only pay for the work that’s done. Legally compliant hiring: we’ve developed the KLARA Home Easy package for you in collaboration with Mobiliar. Are you planning to employ a cleaner or would you simply like to legally insure and invoice your babysitter, nanny or au pair? Are you unsure what type of insurance is required? It’s child’s play with the KLARA Home Easy package: from the work contract to payroll accounting, insurance and mobile time tracking – KLARA takes care of everything. You have comprehensive cover for just CHF 2.10 per hour worked. KLARA Home lets you easily create personalized work contracts with all the required details and generate payslips in the blink of an eye. You can submit the payroll to OASI at the end of the year, as is legally required, at the press of a button. The KLARA Home Easy package offers you comprehensive insurance, including accident, collision damage and legal expenses insurance. You only pay for the time your employees spend working. All your employees have to do is to enter their working hours in the free myKLARA app. The KLARA Home Easy package lets your employees record their hours easily using their smartphones. Expenses can be documented using photos and break times easily logged, meaning that you always have an overview of the hours worked and your expenditure. What's more, working hours are transmitted to payroll accounting once you’ve approved them. Register on our platform now, add the details of your household and activate the KLARA Home Easy package. Our KLARA coaches are here for you! If you have questions about hiring domestic workers, just call our hotline for instant advice. 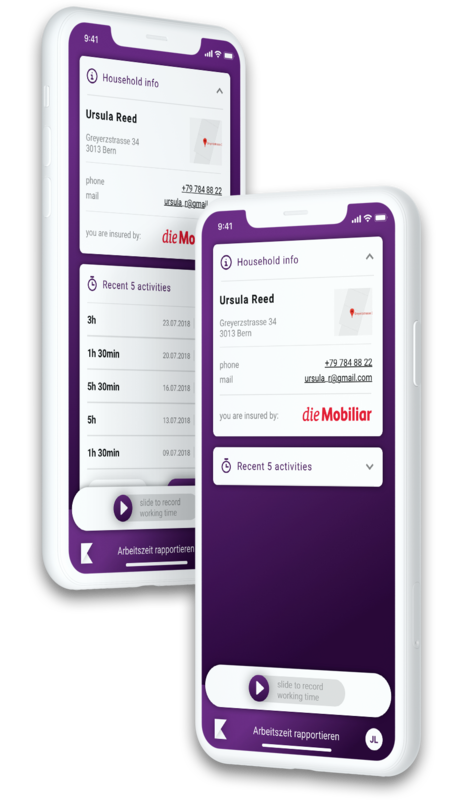 KLARA and Mobiliar offer a unique combination of time logging and insurance. The KLARA Home Easy package includes accident, collision damage and legal expenses insurance for just CHF 2.10 per hour worked. Benefit from added value compared to traditional accident insurance. Kundendaten werden auf sicheren, Schweizer Servern gespeichert. Die Daten verlassen das Land nicht und werden hochsensibel behandelt. KLARA basiert sicherheitstechnisch auf Bankensoftware und erfüllt so höchste Sicherheitsstandards. KLARA ist eine Schweizer Cloud-Software – speziell entwickelt für Kleinunternehmen in der Schweiz. Die kostenlose Business Software bietet digitale Schnittstellen zu behördlichen Institutionen wie AHV und SUVA aber auch zu Kooperationspartnern. KLARA is free – and so is our support. You can find answers to the most common questions in our FAQs. Our online training gives you a deeper insight into KLARA. And if all else fails, you can also get in contact via our hotline: +41 41 329 07 00.